Hi, thanks for stopping by! 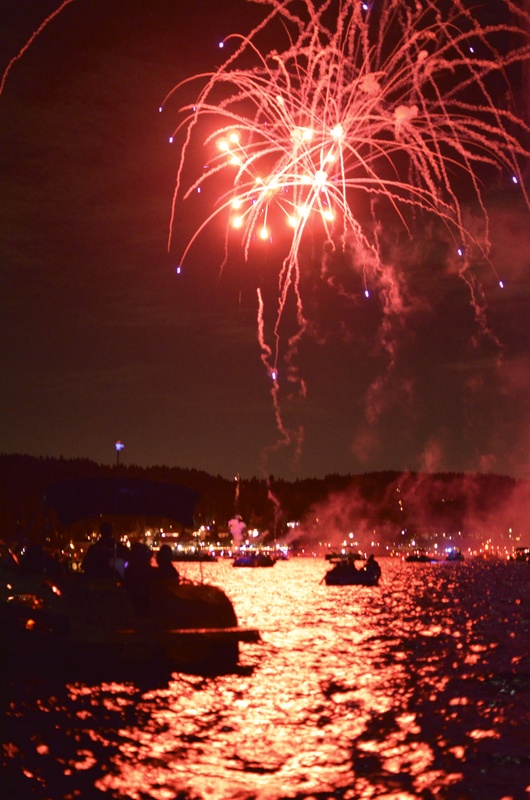 Once again, today I am reliving our 4th of July celebration on Lake Arrowhead and passing along another recipe from that evening. Today I’m sharing my Red White and Blue Sangria Recipe. 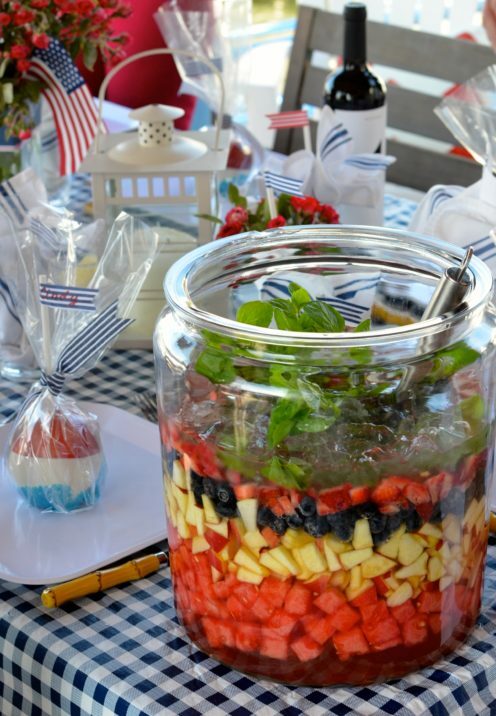 This patriotic White Sangria is the perfect refreshing beverage to serve at your next summer soiree. 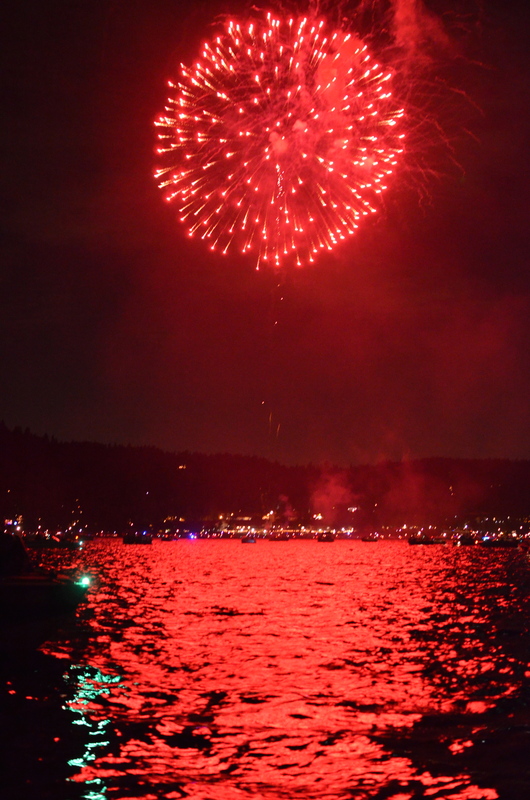 And it was a perfect way to toast a Patriotic 4th of July over Lake Arrowhead. You know, the word “Sangria” is derived from the word “Sangre” which means “blood” in Spanish. Typically, Spanish Sangria is made with red wine, and thus it is red like blood, or like the fireworks we observed as we drank our Sangria. Don’t use expensive wine when making Sangria. The attributes of a fine wine will be lost in Sangria. Sangria needs a good siesta in order to develop the flavors of the added fruit. 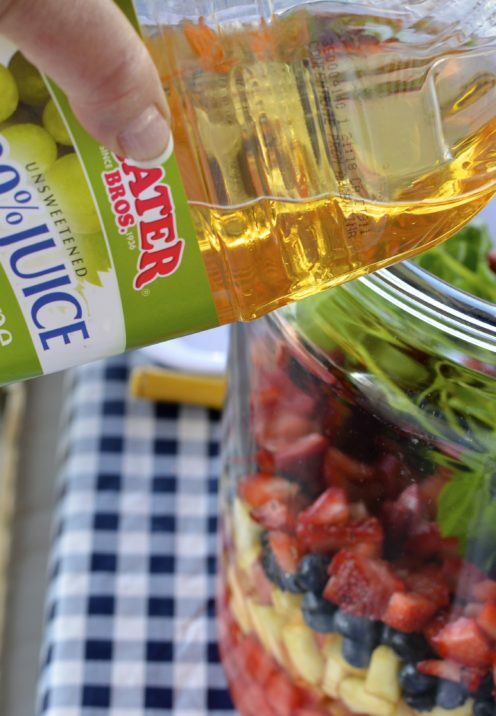 Make your Sangria at breakfast time and you’ll be all set for the cocktail hour. 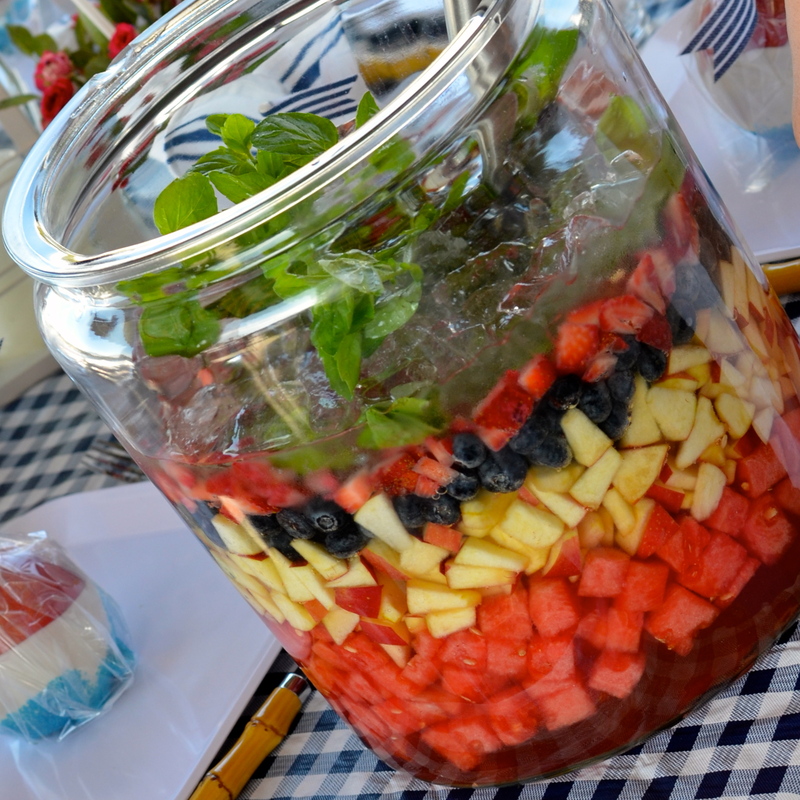 So, let me show you how I make my Red White and Blue Sangria Recipe. Second, the more surface area of fruit exposed to the wine, the more the fruit flavor will be infused into the wine. 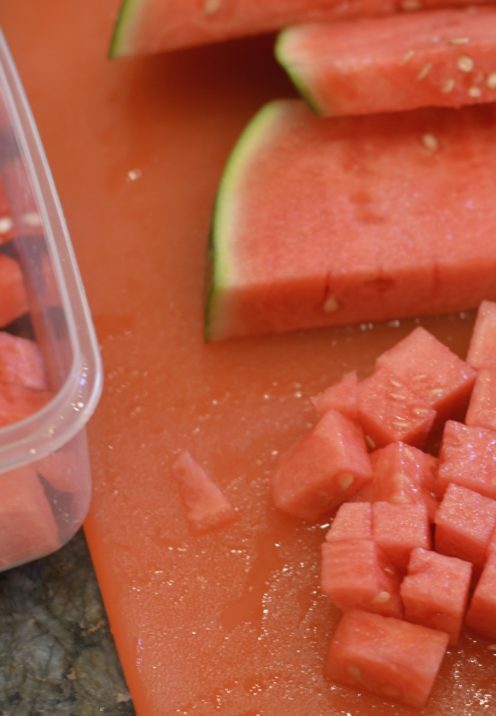 I cut up a mini seedless watermelon into small cubes, producing about 4 cups of fruit. To be honest, it is not particularly necessary to accurately measure the amount of fruit you use in this recipe. And it may also be dictated by the circumference of the pitcher or serving receptacle you choose to use. 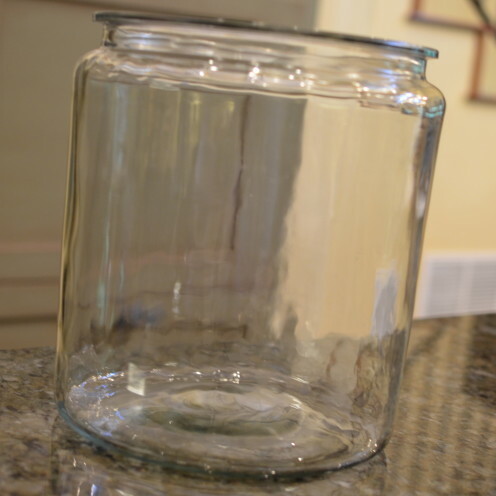 For my Sangria I like to use this large glass jar I bought here. Without the lid it measures 10″ high and 9″ wide so it requires a large quantity of fruit in order for the layers to be seen. If you elect to use a smaller pitcher, you may not use quite as much fruit as this recipe calls for. 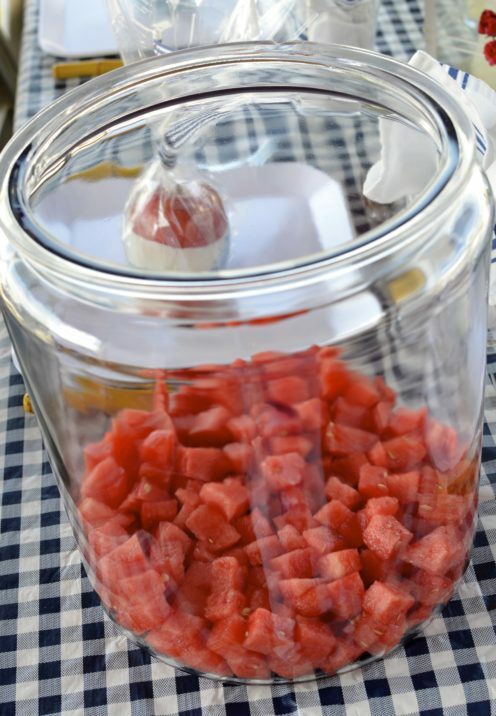 So, go ahead and add a layer of watermelon cubes to your jar. 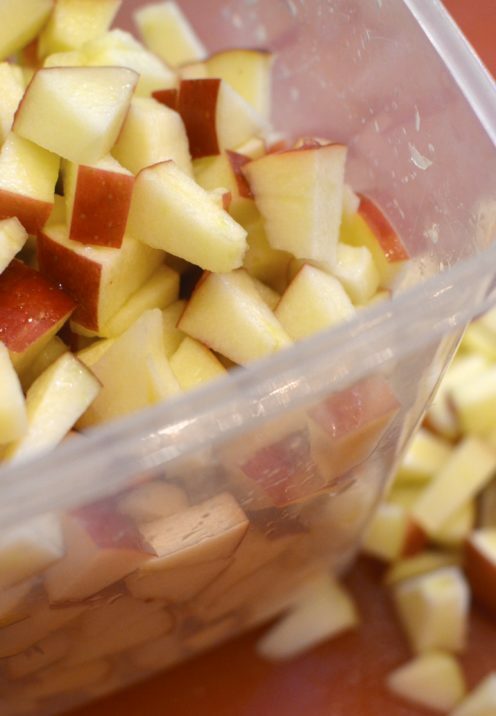 Next, chop up about 4 cups of red apples, skin left on for color, into bite-sized pieces. Layer the apples on top of the watermelon, building it up on the sides. Follow that with a layer of blueberries, again, using about 4 cups. The final layer is approximately 4 cups of chopped strawberries. For color, a hint of flavor, and to use as a nice garnish, I add one bunch of fresh mint into the center of the fruit. Now it’s time to add the liquid. Pour 32 ounces of unsweetened white grape juice over the fruit. That is one half of the bottle pictured. Next comes the wine. If you were making a truly authentic Sangria you would want to use a Spanish wine. But because this Sangria is flavored with berries, I prefer to use a Pinot Grigio or a Sauvignon Blanc. I think these wines complement the fruit flavors better. If, however, I was making a typical White Sangria using citrus fruits such as Oranges, Lemons and Limes, I would use a Spanish Tempranillo wine. 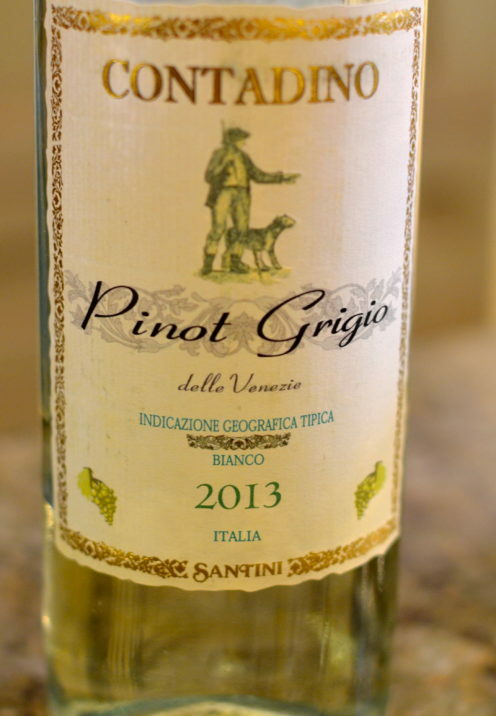 But again, for this recipe I use my favorite Pinot Grigio which happens to be a very inexpensive Contadino brand that I pick up at Trader Joe’s. I recommend this wine for my Red White and Blue Sangria recipe because it has a hint of apple flavor to it and it is on the dry side. A sweeter wine would make this already sweet Sangria too sweet. So, go ahead and pour in a full bottle of Pinot Grigio white wine. Finally, add 1/2 cup of Calvados, Apple Brandy. 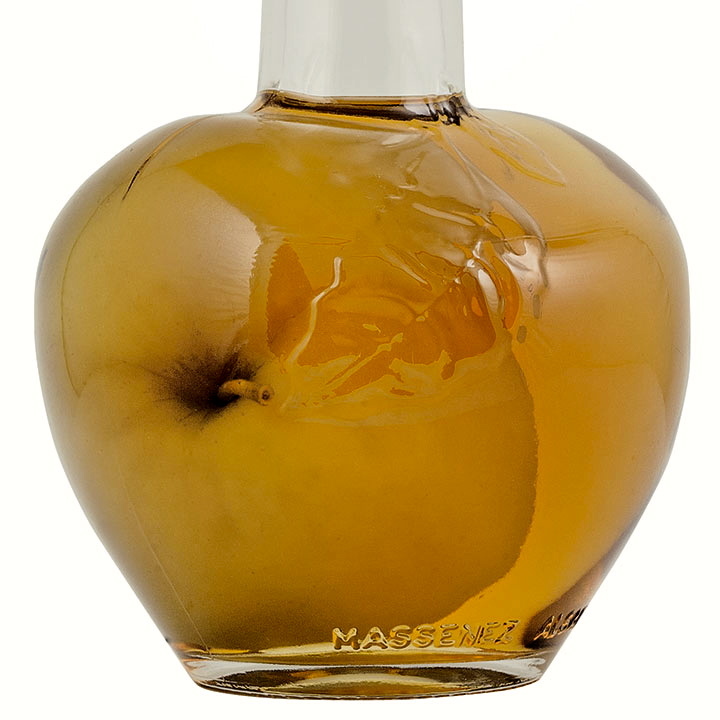 My husband and I fell in love with Calvados when we visited Normandy, France where it originates. We especially loved it for the beautiful bottles it comes in. Once you have done all of the above, place your jar or pitcher of Sangria in the refrigerator. If you planned ahead you could leave it overnight. 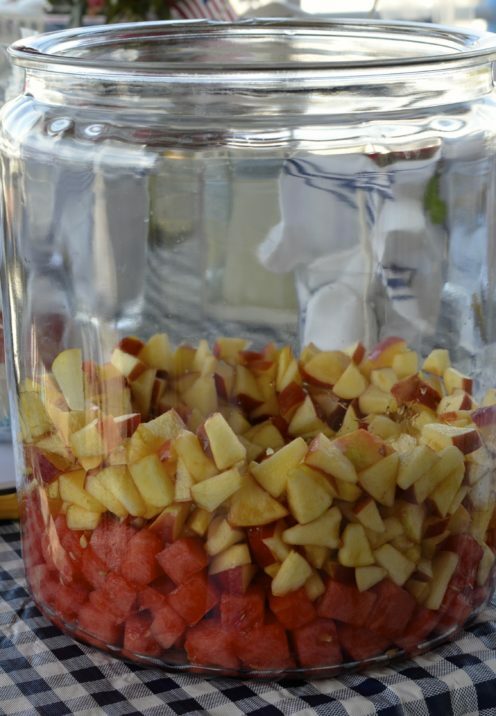 At the bare minimum you will need to chill the Sangria for several hours, allowing the flavors to mingle and develop. 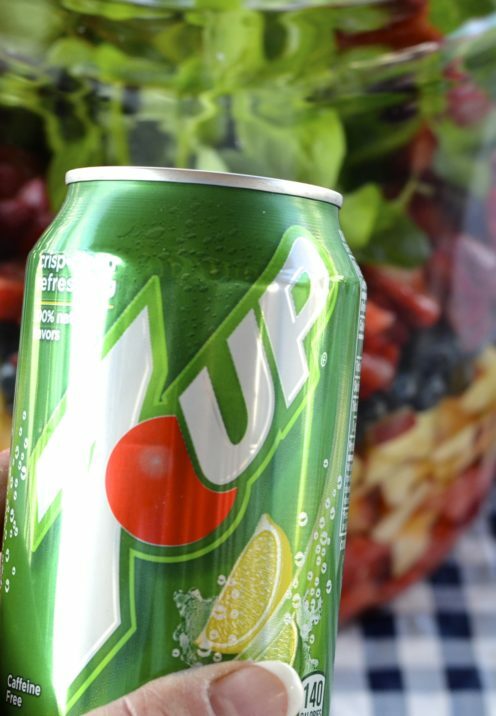 When you are ready to serve your Red White and Blue Sangria there is one final step: add two, 12 ounce cans of 7Up. But before you serve this gorgeous concoction make sure you go show it off. It is almost too pretty to serve! But alas, the final step is to give this beautiful and delicious Sangria a stir. 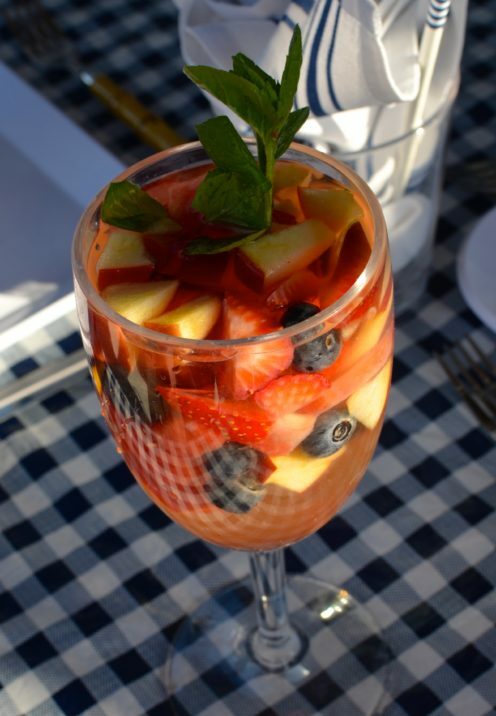 Then, ladle it into wine glasses, giving each glass a generous spoonful of fruit and a sprig of mint for garnish. Now go drink up! It's best to plan ahead when making Sangria, as you'll want to let it take a siesta in the refrigerator for several hours before serving. This helps to develop the flavors. 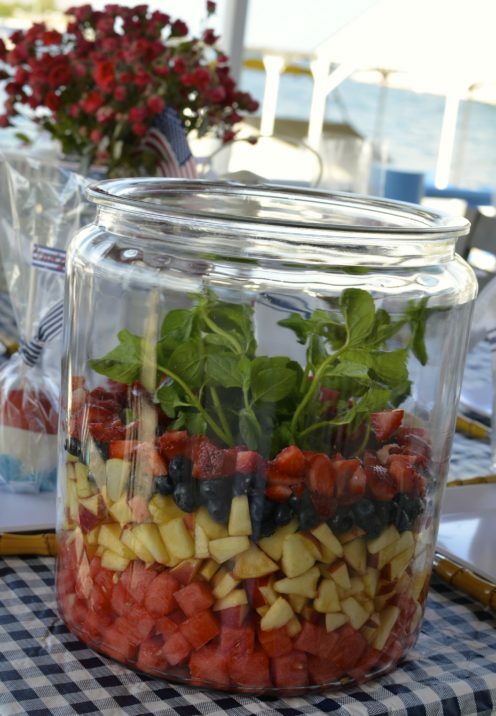 Into a large, clear vessel, layer the fruit in a red, white and blue pattern. 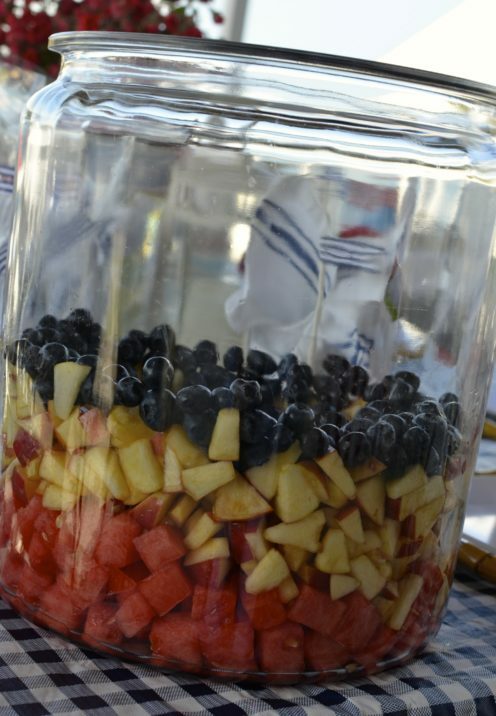 Add watermelon, then apples, then blueberries and finally the strawberries. Pour in the white grape juice, wine and brandy. 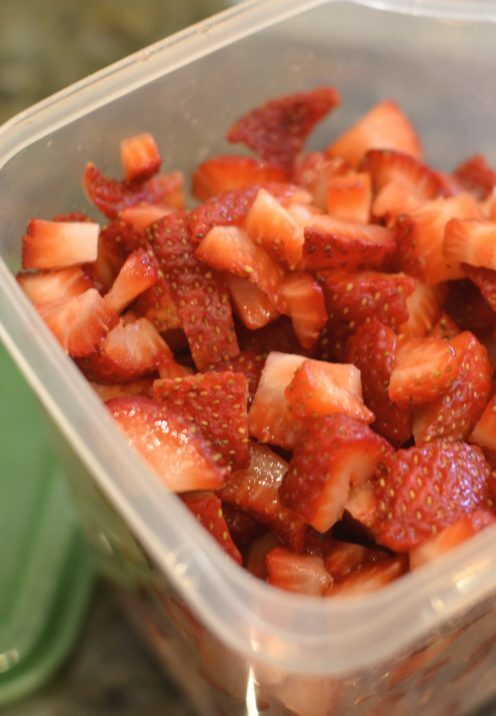 Cover and place in the refrigerator for a minimum of 3 hours and up to 24 hours. Just before serving add the 7Up and garnish with fresh mint. Stir and serve in wine glasses with a mint sprig.